We’re Flaggots Ohio. That’s “Faggots with Flags”…Flaggots Ohio. 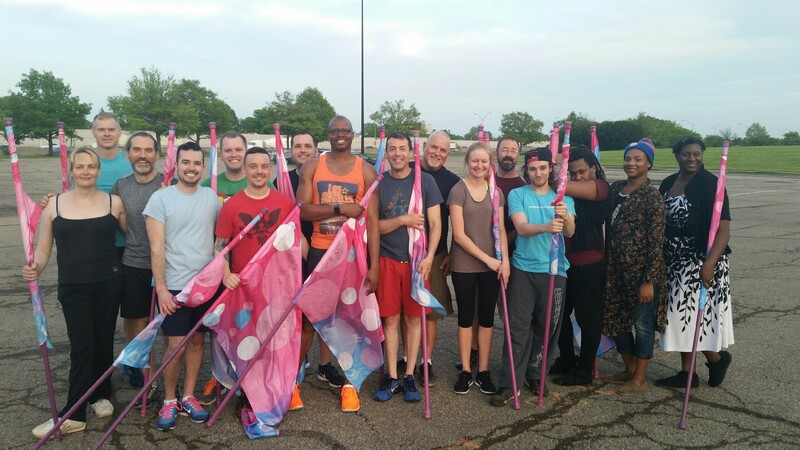 We’re street and stage performers based in central Ohio who use the art of colorguard to entertain audiences at LGBT events across the country. Yes—we’re not shy about taking the power back from that hate-filled word used for bullying and instead making it a term of endearment by adding an “L” for Love! What do you mean by the “art of colorguard,” and why do that? Colorguard is a specific form of pageantry that uses flags, rifles, sabres, and drums to create a brilliant display of color and energy. If you think of the flag and rifle corps in a marching band, you’re in the ballpark. It’s a great vehicle for our message because we use what were originally weapons of warfare meant to divide and hurt people, but we instead use them to celebrate community and bring people together. Proud, colorful, and fun! They are carefully planned to provide something for everyone, audience and performers alike. We always promote uplifting ideas, but sometimes add a touch of playful naughtiness. You might see us marching in your city’s Pride Parade, providing visuals on stage for a drag queen in a nightclub, or doing impromptu street shows at a community arts festival. At Pride celebrations around the Midwest including our hometown of Columbus, at AIDS charity events, the Gay Games, and many LGBT stage shows. Our members have performed across the country in San Diego, Palm Springs, Chicago, Pittsburg, New York City, Atlanta, and St. Petersburg. Who are your members, and where do they come from? We’re a non-competitive, all-volunteer group who live mostly in the Midwest and many of whom have experience from competitive youth colorguard activities sanctioned by groups like WGI and DCI (Winterguard and Drum Corps International). Some of our members also continue to teach high school colorguard groups. Your members look like they are a range of ages. Can anybody join? Because we are proud of our LGBT identity and mission, our minimum age is 18, but there is no upper age limit. We have had performing members in their late fifties! We remain as inclusive as possible given our time constraints. Anybody can join us, regardless of their colorguard experience as long as they can meet minimum performance requirements. In the past, we have taught complete beginners how to spin flags and put them out on the parade route within a year’s time. After several attempts to start an LGBT colorguard in Columbus, our director Matt Eisert and co-founder Joe Bowman finally rallied enough local colorguard veterans in 2002 to mount a full-scale parade show. Flaggots Ohio has performed hundreds of shows across nearly two decades of entertainment ever since. If you had one message for the audience today, what would it be? We’re fans of Dan Savage’s “It Gets Better” Project. We would like to stand up as living proof that it does indeed get better for LGBT youth. Look at us!—we’re mostly middle-aged volunteer performers with careers who come out in our free time to add a splash of color and energy to events we care about for nothing more than fun, joy, and love. Here on our website at FlaggotsOhio.org, our Facebook page and our own channel on YouTube. Just click the links on our home page or search social media for our name—Flaggots Ohio! A more complete history of our group is in the Media Kit download under the Library section of our website.